I know of no one on the planet who defends the disturbing Rio Olympics behavior of 32-year-old American swimmer Ryan Lochte Aramburu. He deserves all the crap that came his way as a result of his hooligan behavior, and he deserves the probable loss of millions of dollars in endorsements that he flushed down the toilet, along with drunkard's urine, that fateful night in Rio. Note to Lochte's former sponsors (Speedo, Ralph Lauren, Airweave, and Gentle Hair Removal): Transfer the sponsorship to the amazing and history-making Claressa Shields! Back to RLA: He also deserves the "cocotazo" (Cuban slang for getting hit on the head with the knuckles) that his Cuban mom hopefully gave him when she found out that Ryan had lied to her, and then to all of us. He even deserves the opinionated racial blame aspect that came out of this boorish incident, dealing with the "white entitlement" angle surfaced by the question (asked first by Bomani Jones) of how different the worldwide reaction would have been had these athletes been black. That's all understandable and clear. But then enter a mind blowing piece in Bustle by Cristina Arreola, which was subsequently picked up by NPR's Leah Donella, and is thus forever destined to fill the sensitive minds of its readers with some of the most convoluted and erroneous information that mixes (and confuses) race with ethnicity and with nationality, that has been ever written. Ms. Arreola is the Books Editor at Bustle, and after reading several of her pieces, I can tell you that she's a really good editor! In the past, I've written extensively on how Americans - and having lived many years in Europe, the Middle East, and Latin America, apparently no one else in the world - often confuse nationality with race, and more often with ethnicity. This is often most common with people with Latin American roots, and usually it is Americans of Latin American ethnicity whom are the most confused. The probably very nice Cristina Mari Arreola is very confused, and unfortunately, she's now managed to spread her confusion to all of her readers, and the ones that NPR reached by echoing her erroneous conclusions. Imagine there are two brothers in a small village in Sweden of ancient Nordic stock straight out of a Gunther Grass novel, and they marry two local Swedish girls. The two young Nordic couples decide to migrate to the New World. "We're going to the United States," declare Sven and Annika. His brother Lars looks at his blue-eyed and very pale wife Uta and says, "Uta and I are moving to Argentina!" They hug at the airport and take flights to the New World. Two years later, Uta gives birth to a healthy young boy somewhere in Buenos Aires and they call the Argentine boy Martin. A few days later Annika gives birth to a healthy little girl in Seattle and they call her Anna. According to the Cristina Arreolas and Leah Donellas of this world, Martin is a "person of color", while his American cousin Anna is a white person. Convoluted uh? From reading Arreola's piece and Donella's subsequent endorsement, it seems to me that this scenario would probably throw these two, I suspect, very nice ladies for a cultural loop. In her piece "Ryan Lochte's White Privilege Is Way More Complicated Than You Think", which is has already spread cultural ignorance all over Al Gore's Internet, Arreola goes to extremes to point out that "Lochte is a white-passing person of color, which doesn't excuse his actions, but instead, makes them infinitely more disappointing." She arrives at this conclusion based on the single fact that his mother, Ileana Aramburu, was born in Havana, Cuba. Thus, in her mind, Lochte cannot possibly be "white" because of the geographical location of his mother's birthplace, regardless of her race. That's her on the right... cough, cough. It is also clear that Arreola has no idea of who the Aramburus are in Cuban history, and their place in pre-Castro Cuban society, otherwise, she would not have made this absurd assumption. 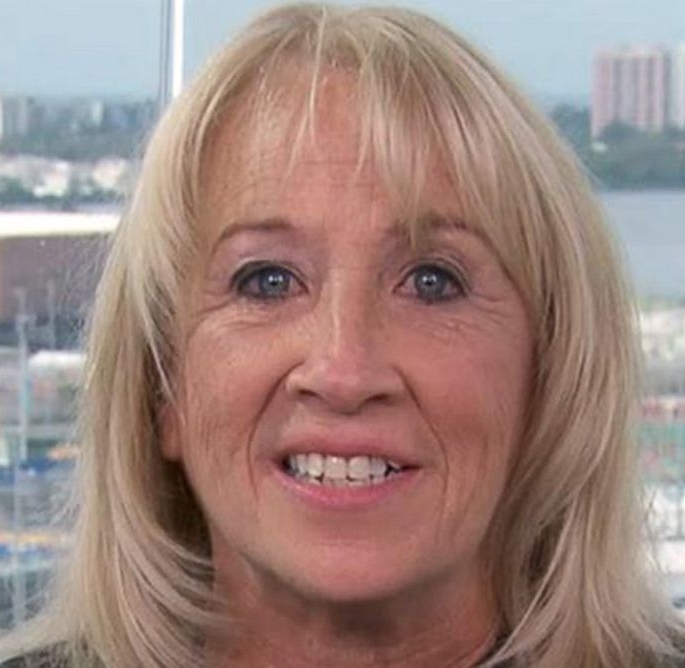 Back to point, according to Arreola, Lochte is not white because her mom (that blonde, blue-eyed, white-skinned lady in the photo above), is "Cuban" and thus can't possibly be white... cough, cough. If Lochte is not white, then what race is he? I suspect that Arreola's answer would be (after showing a little shock that someone is actually asking her that question) "... well, his mother is Cuban!." She wouldn't answer the question directly, but point to Lochte's mom's birthplace and nationality. Her brain wants to say that Lochte's race is "Latino", but even Arreola is not sure of that answer. "Are you saying there's a separate Cuban race?" that mean questioner would ask, forcing the issue. Arreola thinks about it for a second. "Well... no, but Cubans are Latinos," she tries to answer in a round-about away... skirting the real answer floating in her knowledge base. "Ah!," the questioner would obnoxiously point his index into the air. "So you're saying that there's a Latino race!" Arreola would now look perplexed. It is clear that no one has ever discussed or challenged her on this. In her mind, she has accepted and believed the inherently racist precept of "whiteness" as solely American or European. Without knowing it, and certainly without meaning it, Arreola has been endorsing and facilitating a racist precept... most precepts of "race" are. But why and how? This probably quite nice lady, I'd hope has no issue understanding and accepting the other side of the coin; she knows that there are millions of black Latinos, in fact more black people in the nations of Latin America and the Caribbean than the United States (only 4% of all Africans brought in chains to the New World came to the USA). But I suspect that she would raise an eyebrow when told that there are also more people of Asian ancestry in Latin America than in the United States. And more people of Native American ancestry in Latin America than in the United States. By Arreola's faulty logic (and by her faulty logic alone, not her actual beliefs, which based on her article, may be a little twisted around the axle when it comes to this issue), Roberto Clemente, Celia Cruz, and other Spanish-speaking black people from Latin America are not "black", and Peru's former President Alberto Fujimori is not "Asian"- their race is the Latino race. Arreola's cultural brainwashing, plus I suspect a lack of interaction with people from Latin America (not USA Americans of Latin American ancestry), have resulted in a jumbled up misunderstanding of what Latin America is, and who Latin Americans are. She has never walked the streets of Trelew in Argentina and heard Welsh and Scottish Gaelic spoken on the cafes and avenues of that city. She has never hiked the altiplanos in Bolivia and needed a translator to translate to Quechua or Aymara. She has never been to one of the giant coffee plantations around São Paulo in Brazil, and heard Japanese spoken all over the fields. I suspect that her vision of Latin America -- much to her chagrin once she discovers how wrong she is -- has been painted mostly by Hollywood's past racist characterizations of Latin America in their Latino movie stereotyping. And by divisive politicians, seeking to label and separate, a huge multi-hued and multi-cultural, and multi-racial group of Americans of Latin American ancestry. In erroneously trying to paint (pun intended) Ryan Lochte Aramburu as a "person of color", she also inadvertently does a great disservice to all the true Latin American people of color who are brutalized, marginalized, and discriminated against in Latin America, such as the native indigenous people in Mexico and most of Central America; black people in Brazil (in the months leading to the Olympics, hundreds of black Brazilian men were killed by police in Rio province alone), and in perhaps the most racist government in the Americas: Afro-Cubans in Cuba. But I suspect that Ms. Arreola has a USA-only lens, and I would even guess that she's culturally deficient in Latin America's immensely diverse cultures. I would conjecture that she has only seen Latin America, and Latinos, from the American lens of her own upbringing and teaching. This is a rather disorienting issue for a former editor of Latina magazine, where one would think that she would have met people from all over Latin America and thus adjusted the probable mis-education and brain washing of her youth. This is a photo of Ms. Arreola with RLA, where the very pretty and blue-eyed Ms. Arreola poses along the handsome blue-eyed swimmer and jokes "Me and my husband" ... cough, cough. Sorry Ms. Arreola, you can't trade Lochte from the "white team" to the "people of color" team - the hooligan behavior that he committed, and the subsequent cover up (and later apology) may have been evidence (as some suggest) of white entitlement for the simple fact that Ryan Lochte Aramburu, just like his suffering Cuban mom, and his American dad, are all white. Personally, I think that RLA metio la pata.